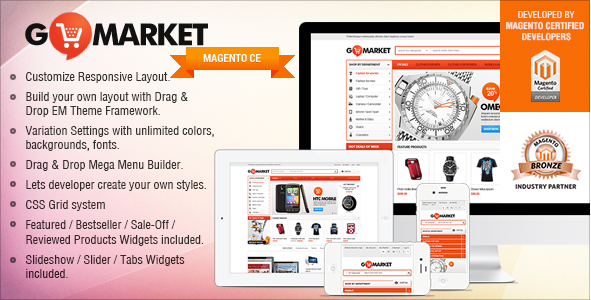 Gala GoMarket is a bundle of 10+ Best Premium Magento 1.9 Themes for Supermarket, Multipurpose & Minimal. Designed & developed by Top Elite Author. This theme is a top of the trending, popular and bestselling theme ever. 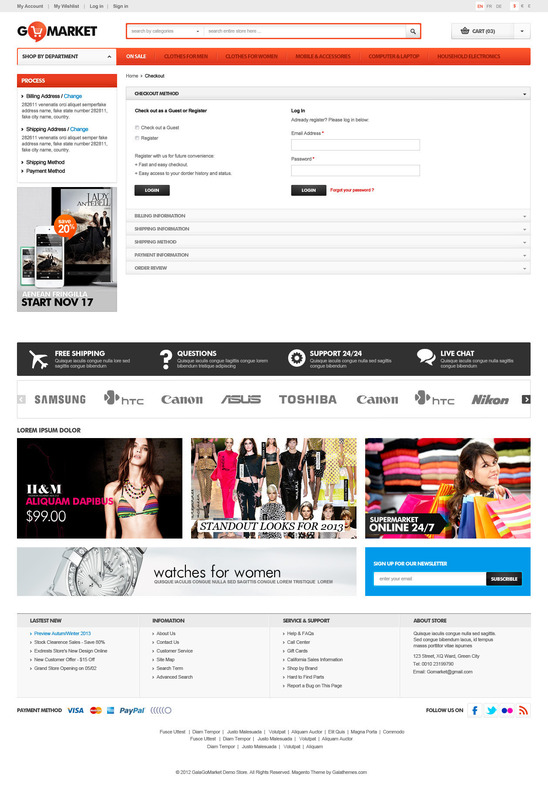 Theme includes various styles: creative, unique, flat, fluid, clean, elegant, simplicity, generic, common, modern, outstanding, eye-catching. Baby & kids toys, nursery. Wow, what you see on the left side of the home page is vertical mega menu which is much more comfortable to follow, watch and keep track within the website. 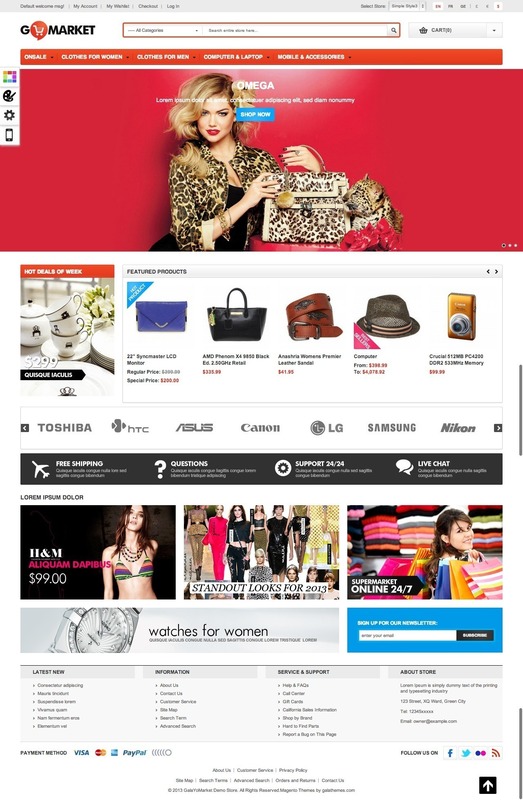 Beautiful visual effect of slideshow, and promotion static block will space up your website to promote hottest deal. 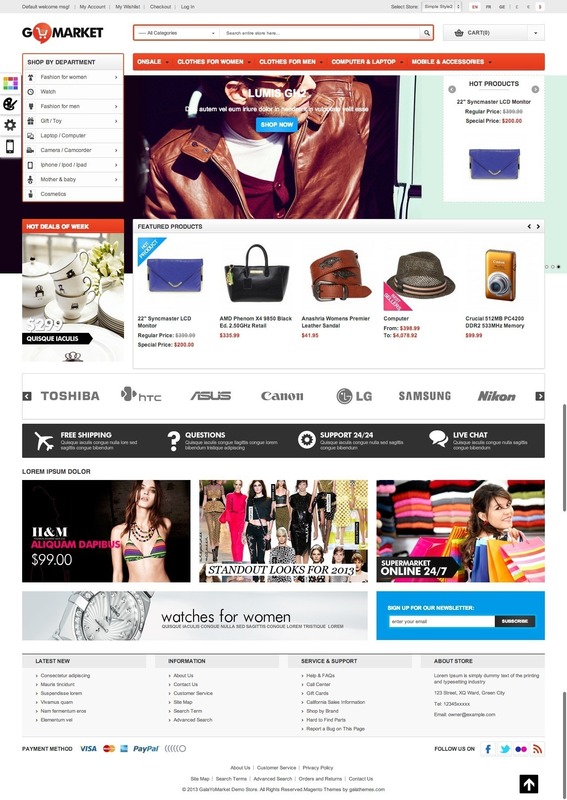 Tab effect shows others product in categories, yet keep it really well-organized. 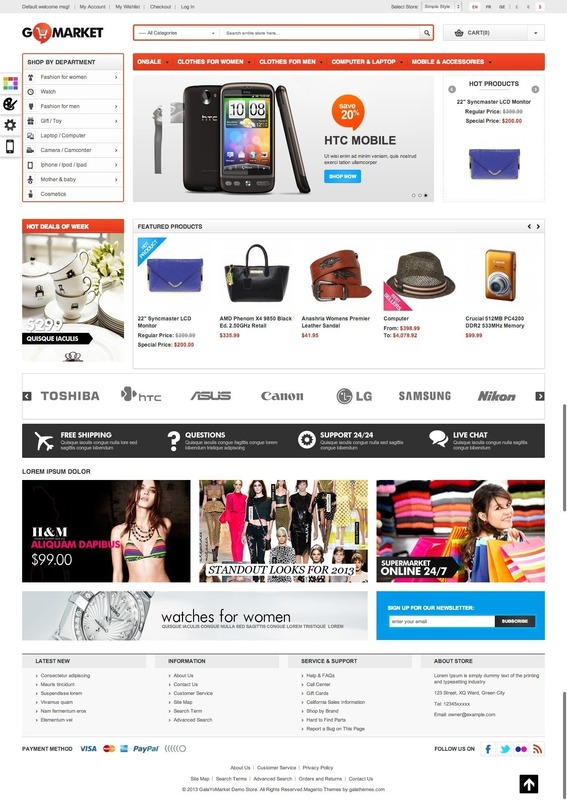 Product widgets, and extra footer make it more informative and also easier to know your greatest offers. Our innovated Theme Framework built-in lets you change and ‘develop’ your own layouts with no restriction. You can add new positions or areas, change your displaying blocks and widgets in any position, change sizes of blocks and columns freely. EM Theme Framework also supports multi-stores that you can assign different stores using different layouts. Another cool feature is let you edit your blocks visually. No more wasting time for finding block name in user guide. Essentially support viewing Mega Menu on mobile with smart sliding menu allows to view all content in sub menus. Support native browser’s back button. Allow to create and manage product labels show on top of product images like to indicate bestseller, new, special products… You are freely to create more label and configure conditions to display labels in the backend. All product images, product thumbnails’ sizes can be configured in the backend as you want. If your web store has different background color, you can configure product image background accordingly. - added custom style Instruments. - added custom style Pharmacy. - fixed disable default menu does not work.